March 2, 2009 Nissan will showcase the GT-R in a driving challenge on the Jebel Hafeet Mountain road with Mohamed Ben Sulayem. 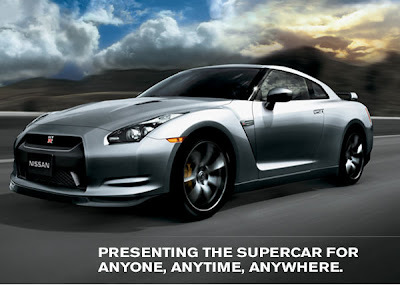 Nissan plans to sell 200 Nissan GT-R's in the Middle East in 2009. Tokyo (February 16, 2009) - Nissan Motor Co., Ltd. (Nissan) today announced the launch of the high-performance Nissan GT-R in the Middle East. The highly coveted Nissan GT-R will be sold and serviced at a limited number of Nissan High Performance Centers in select locations throughout the Middle East. These outlets have been certified to meet the exacting standards needed to maintain the high level of performance for the Nissan GT-R. Nissan Middle East FZE (NMEF) projects some 200 passionate enthusiasts will become proud Nissan GT-R owners in 2009. Global production of GT-R is limited to 1,000 units per month. In order to showcase the outstanding capabilities of the award-winning Nissan GT-R supercar, NMEF will conduct a driving challenge March 2 on the Jebel Hafeet Mountain Road. For the special event, the GT-R will be driven by famous rally driving legend Mohamed Ben Sulayem, the most awarded rally driver in the Middle East. "The Nissan GT-R enjoys legendary status in the Middle East, so we decided it would be most fitting to create a memorable and challenging event for the car's launch," said Atsuo Kosaka, NMEF's managing director. "The GT-R Jebel Hafeet Challenge will showcase this remarkable car's dynamic ability in the hands of our region's most successful rally driver. It will be fascinating to see how quickly the GT-R can ascend the mountain and set a benchmark time." Jebel Hafeet is a mountain south of Al Ain, Abu Dhabi, the United Arab Emirates (UAE). Scaling it is the Jebel Hafeet Mountain Road, which has been called the greatest driving road in the world. With 21 corners and three lanes, the road runs 11.7 km to a height of 1219 m at mountain summit, atop of which a spectacular view can be fully appreciated. A seven-km stretch of the mountain road will be used for the GT-R Jebel Hafeet Challenge. "The Jebel Hafeet mountain is the UAE's most challenging stretch of road, and it will be a fine test of the GT-R's power, performance and poise," said driver Sulayem. In preparation for introduction to the market, Nissan's multi-performance supercar underwent several tests around the world, including on the track of the Dubai Autodrome, a 5.39 km motorsports circuit located in Dubai, UAE. The Nissan GT-R received the "Most Advanced Technology Award (Car of the Year Japan 2008-2009)" and was named the "2009 Motor Trend Car of the Year™ (USA)," among a number of other prestigious accolades.